Tom lived in Los Angeles. You might have seen him, even passed by him as he found shelter for himself alongside a freeway. Like nearly 45,000 others, he was homeless. After years of living on the streets, his health deteriorated, and he was diagnosed with lymphoma. He was estranged from his two children and, aside from one friend, was entirely alone. What happens to homeless people who fall ill? Typically, once their hospital stay is over, they return to the streets. But can we really expect someone to heal on the streets, exposed to the elements, without proper nutrition, and with no follow up? After discharge, many homeless people face additional setbacks that land them back in the hospital. According to a 2012 study funded by the Robert Wood Johnson Foundation, the hospital inpatient 30-day readmission rates among homeless patients reached almost 51%. But the expense of repeated hospital stays is only part of the issue. 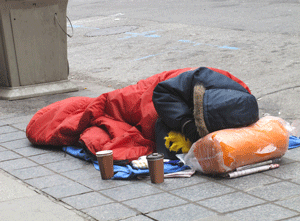 What is the human cost of healthcare and homelessness? Tom’s condition was terminal, it didn’t change the fact that he needed care and that recuperative care was going to be the most compassionate and cost-effective solution. Licensed nurses coordinated hospice services as he neared the end of his life. Tom had no family, but we made sure he could call his last remaining close friend whenever he needed to talk. Though quiet, Tom was friendly and communicative until the end, when he deteriorated rapidly and passed peacefully in his sleep. Tom spent his final days being cared for in a compassionate and supportive environment. He did not die alone, homeless on the streets of L.A. While this may not sound like a typical success story, it is an important one to share. National Health Foundation is privileged to provide Tom, and many like him, with the services, comfort and dignity they deserve as they face serious illness and injury, and we thank West Hills Hospital for helping us make a difference. Homelessness and illness together pose extraordinary challenges for the patient and for those wishing to deliver proper care. Homeless patients often die on the very streets they live on and healthcare providers, without appropriate discharge options, are often forced to make the difficult choice to return homeless patients to the street without the benefits of follow-up care. Our vision is that every individual, regardless of who they are or where they live, should have access to a comprehensive and compassionate system of care. Kelly Bruno is the CEO of National Health Foundation, a non-profit organization dedicated to improving and enhancing the healthcare of the underserved by developing and supporting innovative programs that can become independently viable, provide systemic solutions to gaps in healthcare access and delivery, and have the potential to be replicated nationally. NHF is proud to be a CCF grantee. Through its recuperative care and bridge housing programs, NHF plans to place 100 homeless individuals into permanent housing and 50 individuals into permanent supportive housing in the next year and a half.